The Pléiades image acquired on April 25, 2013, show construction on the Corinthians Arena in São Paulo. In the run-up to the 2014 FIFA World Cup tournament, which kicked off Thursday (June 12), Brazil spent billions to build and spruce up soccer stadiums in 12 cities across the South American country. Over the past few years, European spacecraft snapped rare views of this mammoth (and controversial) construction process from space. The French Space Agency (CNES) released images of Brazil's World Cup stadiums from its two high-resolution Pléiades satellites, which launched in 2011 and 2012 and are tasked with taking pictures of Earth. One image from April 2013 shows the flagship Corinthians Arena in São Paulo — where Brazil beat Croatia 3-1 on Thursday — still in a skeletal state. The metallic beams of its roof are being assembled, the parking area is under construction, and the earth is being prepared for the lawn that would become the brand new arena's field. 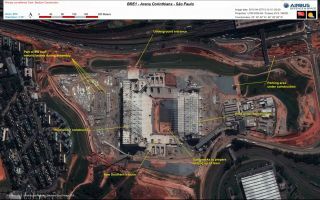 The twin Pléiades satellites of Airbus Defence and Space have captured images of the 12 soccer stadiums in cities across Brazil which will host the 2014 FIFA World Cup tournament. A year later, in April 2014, with the games just weeks away, the satellite images show that there were still construction cranes around the stadium as work on the roof continued. Media reports indicated that the arena wasn't completely ready as of just last week: Though the $450-million stadium was decked out with a massive LCD screen and other high-tech features, the roof wasn't complete and temporary seating areas were unfinished, NPR reported June 5 after a test match. Other images from the Pléiades satellites show Brazil's vintage stadiums, including the 62,547-seat Mineirão Stadium in Belo Horizonte and the 43,50-seat Arena Pantanal in Cuiabá, both of which were built in 1965. NASA's Earth Observatory also released World Cup-related images in celebration of the month-long soccer tournament, with observations from the Suomi NPP satellite that show the host country lit up at night. And astronauts living on the International Space Station who plan on watching the games made a World Cup tribute video, kicking soccer balls in microgravity.